Rylstone doctor Jack Farrar was one of 100 Australian doctors who answered the plea from British War Secretary Lord Kitchener for help to bolster the war effort in 1915. More than 100 years after he enlisted Jack’s story has inspired a 560 page account of the lives of his colleagues who would become known as Kitchener’s One Hundred. Rylstone born doctor John ‘Jack’ Farrar has inspired a detailed volume on the lives of 100 Australian doctors who answered the plea from British War Secretary Lord Kitchener for help to bolster the war effort in 1915. Lina Stunden never imagined a volunteer shift at the Rylstone Historical Society would lead her on a six-year investigation into the lives of a group of otherwise forgotten Australian trained doctors and surgeons who served in the First World War. “I joined [the Rylstone Historical Society] and asked if anyone was writing a book on WW1, no one was and they were happy for me to begin but then I got sidetracked by John William Farrar or Jack as he was known,” Lina said. 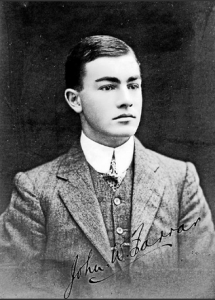 The son of publicans and farmers, Jack was fresh out of Sydney Medical School when he enlisted as a doctor on a hospital ship in the Pacific in 1914. A year later he re-enlisted with 99 other young doctors, among them doctor Robert Burnside Carter, who settled in Mudgee following the war. The men, most of whom were in their early twenties, were dispersed across the European front. “Most of them were in their final months of university study and the British wanted single young men because they were seen as expendable,” Lina said. Lina discovered the British attitude toward the group was one of disdain. “There were accounts that they were made to fill potholes and build toilet blocks with their fine surgeon’s hands,” she said. Without solid records Lina took her search to school and university records that often had copies of the men’s published letters. It was then a painstaking process to find living relatives on Facebook and in the White Pages. “The whole process was great because I had no idea that I would uncover the lives of these amazing men and their families,” Lina said. Of the remaining family members she did contact, Lina said very few knew of their relative’s service. “Nearly all of the remaining family members said their fathers didn’t talk about war,” she said. Sadly she discovered that seven of 100 were killed in battle, three committed suicide not long after the war and two more later in life. She said reading about the horror they faced gave her strength to pursue the book and matters in her personal life. “I loved it, I have a child with cerebral palsy and the process of writing the book has helped buck me up when I felt a bit down and read about courageous people like that and what they went through,” Lina said. Source: Mudgee Guardian, news article, http://www.mudgeeguardian.com.au/story/3697523/rylstone-doctors-story-inspires-book-kitcheners-one-hundred-tells-story-of-wwi-medicos/, accessed 31 March 2016.